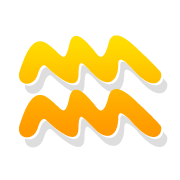 Free weekly horoscope for Aquarius star sign, for the week 22 Apr - 28 Apr Read on to find out how this week’s astrology aspects will affect you, in matters of love, career and more. Dear Aquarius, this week, you, yourself, will make the changes. Your need to create harmony in your everyday life makes you find ways to achieve it. Your relationships with those around you, be it friends or co-workers, or family, will preoccupy you, as you seek the right balance that will bring you inner peace. Your inventiveness is increased and so is your need to change things so that you feel more free and independent. Make use of these predictions, not only to feel better, but also to improve your life on a practical level. This week allows you to relax and look at your relationship through a different lens, so that you improve your love life as a whole. Your partner has always been important to you, but right now it is very important to calm down and make the mood pleasant, warm and serene. Create the right conditions that will allow you to enjoy the passion that unites you and to express the feeling in every way. Have fun at the side of your partner, forgetting the worries and the anxiety. Your will be very successful at your job. You will be able to overcome problematic situations and provide solutions to issues that have troubled you recently. You will be able to assess the situations and find the ideal way to manage them. Since you can work so efficiently, give new substance to your partnerships and close the deals you want. In your finances, the way you deal with situations helps you set some new, solid foundations. Debts enter a repayment process and you are disciplined enough to stick to the plan. ♒ Get now more details about the impact of the planets this week, based on your ➳ Weekly Horoscope.